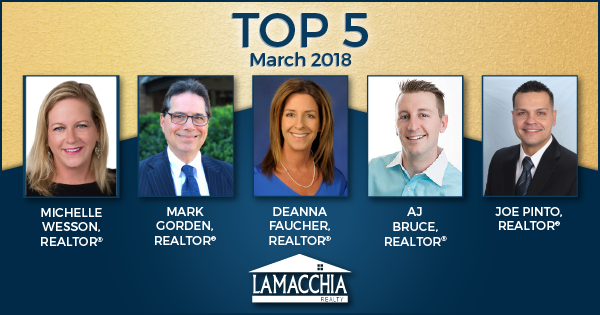 Waltham, MA – Lamacchia Realty, Inc. has released their “Top 5 Producing Agents,” for March 2018! This program recognizes Lamacchia Realty agents with the top five highest transaction numbers or sales for the month. March 2018 winners of the Top 5 are Michelle Wesson, Mark Gorden , Deanna Faucher, AJ Bruce and Joe Pinto. Mark Gorden joined Lamacchia Realty in 2017. He works out of our Worcester office and knows central Massachusetts area well having lived in Westborough for the past 20 years. Mark is highly regarded for his kind manner, exceptional customer service, and reliability. To learn more about Mark, click here: Mark Gorden. Deanna Faucher has been a Realtor since 2011 and joined Lamacchia Realty in early 2016. Growing up in Shrewsbury and residing in Worcester with her husband and son for the past 20 years, she is able to assist her buyers and sellers in Worcester County with complete confidence. To learn more about Deanna, click here: Deanna Faucher. AJ Bruce has been excelling in customer service for 15 years. Working and actively engaging with people is his favorite part of his career along with helping them accomplish goals. To learn more about AJ, click here: AJ Bruce. Watch AJ’s bio video by clicking here.